Shira Strongin, a freshman majoring in political communication, was bullied and called “the sick chick” in elementary school. She reclaimed the name for her personal blog, which became a public platform to empower and unite women with illnesses and disabilities. 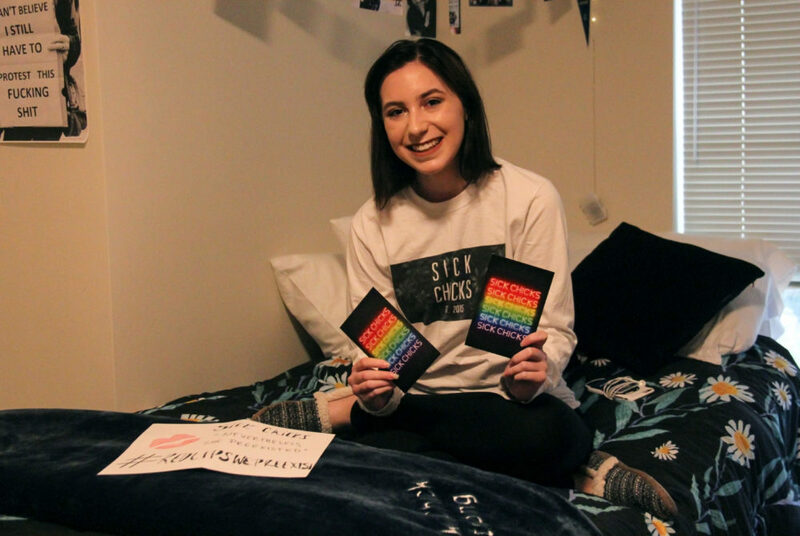 A freshman who was bullied and called “the sick chick” in elementary school reclaimed the title as a pen name for her personal blog, Sick Chicks, to empower and unite women with illnesses and disabilities. Shira Strongin, a freshman majoring in political communication, started an anonymous blog to document her journey with an undiagnosed neurovascular disease when she was 11 years old and now reaches a community of about 2,500 people through social media and hosting in-person events. Strongin received a $36,000 grant from the Diller Teen Tikkun Olam Awards last month that she plans to use to become a 501(c)3 organization, start a college scholarship fund and host more events for women with disabilities. Strongin said she originally wrote under the pen name “the sick chick” because she felt embarrassed about her illness and wanted to help others dealing with their own diseases and disabilities. Two years ago, she turned her anonymous, personal blog into Sick Chicks — a website to support women with disabilities through a blog, online store and monthly events. “I realized this needed to become something bigger than just my own story,” she said. Strongin said doctors have diagnosed her disease differently throughout her life, but they still can’t give her an answer on exactly what neurovascular illness she has. She has had multiple serious neurovascular complications and seizures since she was 11 years old that have left her with aphasia, a loss of ability to understand or speak, and apraxia, a neurological condition that affects a person’s ability to perform normal motor functions. Strongin is currently on chemotherapy and two high-dose blood thinners. She said that she has seen doctors all over the country to diagnose her and had to relearn how to walk many times. She has also had to relearn how to read and write over the past year and a half. “Going back to the middle school bullies, I can’t expect them to understand when even my own medical professionals don’t understand what’s going on,” she said. There are many blogs dedicated to coping with an illness or disability, but not as many that motivate you to do something about it, she said. As one of the 15 Jewish teens selected for a grant from the Diller Teen Tikkun Olam Awards, Strongin plans to use the money she received to start a scholarship fund for women with disabilities – something Strongin said was difficult for her to find during her college application process. Missing multiple days of school and undergoing nontraditional schooling, like being home schooled, makes it difficult to get academic scholarships for college. Other scholarships, based on athletics or community service, seem unattainable for someone who spends most of her time in bed or at a hospital, she said. “I want something that can actually be specific for young women who are sick who want to go into some kind of advocacy, whether that is advocacy through medicine or something else, just sticking with the empowering theme,” she said. Strongin launched an ambassador program in June for women around the world to represent Sick Chicks and host events in their communities. There are currently 25 ambassadors, and Strongin said that she has received interest from about 50 more girls who will apply when the next application for ambassadors goes live in December. Strongin hosts accessible, “normal” nights about twice a month, packed with fun activities like karaoke, movies and board games. She used to be the only one to host them in California and in D.C., but thanks to the ambassador program, the events are now taking place all over the country. Strongin said the events are a great way for girls with disabilities to get out of the house and feel normal, something they don’t often get to do. “Nobody looks at them weird because everyone is doing their own little weird thing as they’re changing out their tube or doing something that would be looked at anywhere else,” she said. The events are taking place across the country, from Las Vegas to Chicago, with her 25 ambassadors hosting them, including a pajama party in Las Vegas Thursday hosted by one of her ambassadors. Strongin said she has hosted about 25 events herself, with about 30 girls attending each event. At an event she hosted last June, a tearful mom told Strongin that this was the first time she’d seen her daughter smile and laugh in six months. Strongin said that was the greatest reminder of why she does this.